Lagio was created with today’s digital lifestyle in mind and to provide the premier lap desk space for all your work and entertainment needs. 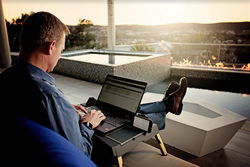 Lagio, the versatile lap desk created by the team at Aeon Gold, has reached its funding goal of $25,000 on Kickstarter. Lagio turns anywhere into the perfect corner office with premium features and functionality in an elegant design. Lagio was designed to sit comfortably in the lap or propped up on any surface, such as a couch, bed or chair. Its adjustable legs create the perfect ergonomic position for the workspace, allowing the user to sit comfortably with proper posture. The legs also tuck neatly away into internal compartments when not in use. The desk itself maximizes functionality with a large space for writing or a laptop, tablet, smartphone and mouse. Additional features include a removable cup holder, Post-It™ note tray, Bluetooth speakers and LED lights. The integrated and functional modular design, in conjunction with the elegant use of natural and man-made materials, sets Lagio apart from the rest. Keeping in mind users’ digital lifestyles, Lagio understands the need for power charging and offers a portable, rechargeable power bank for tablets, cell phones and most laptops and electronic products. It was designed with integrated cable management to store away unsightly and inconvenient cords. Users can also provide power to the optional Bluetooth Speakers or to the LED lights, making it perfect for reading books or other written material while listening to music. The Lagio storage compartment opens up to reveal a holding area for papers, cables, portable batteries, pens, styluses and other items. Lagio’s unique heat dissipation design keeps air flowing so computers and other electronics stay cool no matter how many hours of work are put in. Customers can also upgrade their desks to include optional webbing made of leather, lamb skin, faux fur or real fur that clips to the bottom of the desk for additional comfort and cooling. Lagio is currently available on Kickstarter for $119. For more information or to pre-order, visit pr.go2.fund/lagio. The Aeon Gold team saw the need to create premium, luxury products to support their digital lifestyles, while incorporating great design and aesthetics into appealing, yet highly functional products. For their first product, they chose to design a highly functional and elegant lap desk that significantly improves the style and capacity of laptops, tablets, phones and other digital devices. For more information about Aeon Gold or Lagio, visit https://producthype.co/lagio/.